In the Summer of 1997 (after the material for the self-titled debut was recorded) we went on a short summer tour. I had been in other bands with Chris and Adam since the 9th grade so we were already used to working together. In the Fall of 1997 we recorded Under the Running Board. In the Summer of 1998 we toured with Jesuit and Botch and finished up at the Milwaukee Metalfest. We also did a recording of three songs that ended up being re-recorded for Calculating Infinity. One song from those sessions ended up being released on a split CD with Nora. While on tour I decided that I wanted to leave the band. I was burned out on the guitar and wanted to focus on computer science. I am not trying to say that everyone should do this, it was just my personal feeling. I still enjoy playing the guitar on a part-time basis. It is too much of a part of me to just drop, but at the time I simply lost the drive to play it like I used to. I found that I enjoyed putting my energy into other creative processes. It may sound strange, but I actually think that programming is artistic in a way that is similar to creating music. I let the guys know that I wanted to quit the band at the end of the Summer tour. 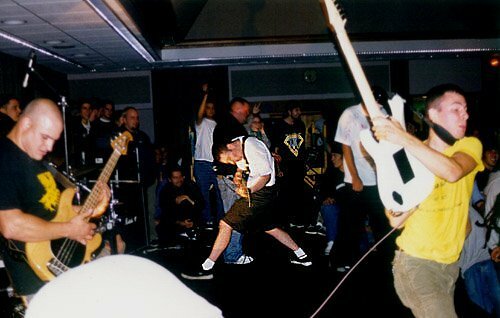 However I came back to do some shows in the Fall of 1998 until Brian Benoit took over on second guitar. I had a really good time playing with Dillinger and I thank them for giving me the opportunity to play with them.